I have just reviewed Zaitoun by Yasmin Khan. The book’s subtitle is Recipes from the Palestinian Kitchen. That’s precisely what this book offers, eighty recipes from the Palestinians living in Israel and the adjoining areas. The land is trouble politically. The land is grand culinarily. This recipe is typical of the book, a burst of colors and flavor that will surprise you, satisfy you, and have you searching for other recipes in your copy of Zaitoun. Preheat the oven to 400°F. Place the cauliflower florets on a large baking sheet and drizzle over the cooking oil, cumin and allspice. Season generously with salt and pepper and give the florets a good stir so they are evenly coated. Transfer to the oven and cook for 20-30 minutes, until the cauliflower is tender but still firm, tossing halfway through to make sure the florets cook evenly. Leave them to cool slightly while you make the sauce. Whisk together all the ingredients for the tahini sauce with 7 tablespoons water and season with salt and pepper. 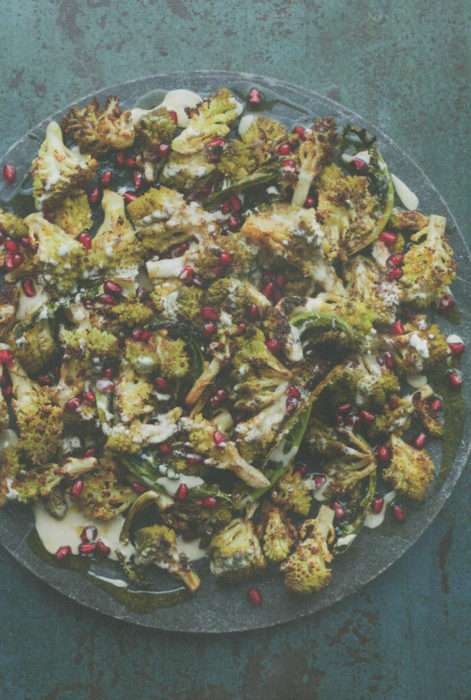 Once the cauliflower has reached room temperature, place on a platter, drizzle over the tahini sauce and sprinkle with the pomegranate seeds.